The richest woman in the world, according to a respected business magazine, is not Oprah Winfrey, Queen Elizabeth II or L'Oreal heiress Liliane Bettencourt. It's a relatively unknown Australian mining magnate. 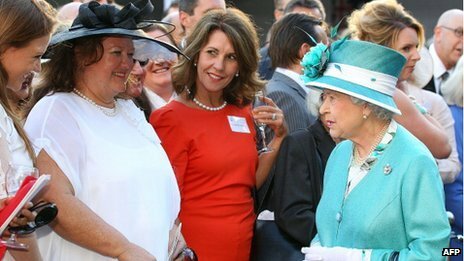 So who exactly is Gina Rinehart? 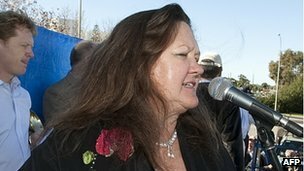 Asked once to sum up her concept of beauty, Gina Rinehart did not point to the pearls that so often adorn her neck. Nor did she rhapsodise about the ochre landscape of her beloved Pilbara, a beautiful, if unforgiving, expanse of land in the northwest corner of Australia. Instead, she spoke of the unlovely commodity that has made her family rich, and the giant holes in the ground from where it came. "Beauty is an iron mine," she famously remarked. When her father, Lang Hancock, discovered one of the world's biggest reserves in the early 1950s, the export of iron ore was banned in Australia because it was deemed such a scarce and finite resource. Tens of thousands of iron ore shipments later, royalty payments from that Pilbara mining field in Western Australia continue to swell her coffers. The Hancocks were not the sole beneficiaries. The multi-billionaire fervently believes that her father's discovery also made Australia prosperous, which partly drives her recent quest for influence, gratitude and respect. It is partly borne of a lifelong sense of grievance - that Australia's traditional east coast elites have not recognised her family's contribution to the country's development, nor the local media. 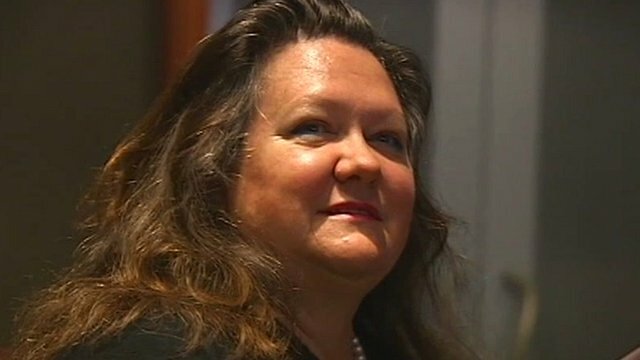 With an estimated net personal wealth of $A29 billion ($US29.3bn, £18.79bn), Rinehart has in recent years gone from being Australia's richest woman to Asia's richest woman to arguably the world's. Australian business magazine BRW has named her the world's wealthiest woman, and Citigroup has also predicted that the 58-year-old businesswoman will soon top the global rich list, with more than $100bn (£64.8bn) of assets to her name. The royalty stream from that initial discovery - the "rivers of the gold," as it has been called - still contributes to her wealth, but it pales alongside the value attached to her mining interests in Western Australia and Queensland. She hates being called a mining heiress because she considers herself a self-made businesswoman who turned her company around after her father's death in 1992. From a worldwide perspective, her spiralling wealth illustrates the shift in economic activity from the west to the east. From an Australian one, she embodies the shift from the east to the west. Once it was media moguls like the late Kerry Packer who topped the Australian rich lists. Now it is minerals magnates who are profiting from the country's China-fuelled resources boom. Rinehart has set out to become both a magnate and a mogul, which is why she is the subject of so much attention and controversy. Along with her mining interests, she now owns a share of Channel Ten, one of the three major commercial television networks, and has also become the single biggest shareholder in Australia's second largest newspaper group, Fairfax Media, although she reduced the size of that stake last week. The group publishes three of the country's most venerable mastheads - the Sydney Morning Herald, the Melbourne Age and the Australian Financial Review, and the suspicion among many Fairfax journalists is that she will attempt to turn them into mouthpieces for her right-wing views. The dark joke is that the Sydney Morning Herald might become the Sydney Mining Herald. However, she has not been able to gain seats on the board because of a dispute about her refusal so far to accept the group's declaration of editorial independence. Her mining company, Hancock Prospecting, is essentially her life. She has few outside interests. She does not go in for the normal blandishments of wealth, like art, racehorses or a private plane. She is renowned for her 24/7 work regime, and a tunnel-visioned determination. Her personal feuds are the stuff of legend and her long list of adversaries has included her father, his business partner, her first husband, her Filipino mother-in-law, Rose Porteous, and now three of her children. Famously litigious, many of her battles have ended up in court. 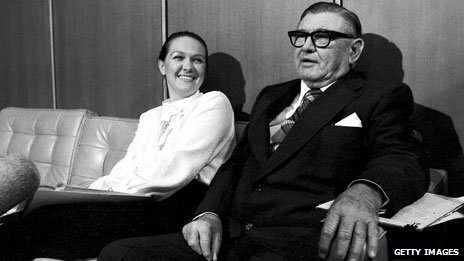 "Whatever I do, the house of Hancock comes first," she once told a reporter. "Nothing will stand in the way of that." Like her rambunctious father Lang, who railed against the scourge of "Canberra-ism," and "eco-nuts" in the environmental movement, her political views are a blend of conservatism and libertarianism. An early heroine was Britain's Iron Lady, Margaret Thatcher, whom she met over lunch in 1977. Afterwards, the young Gina took much more care to dress in a business-like fashion, got a new hairdresser and started to wear more make-up. Another intellectual hero was the free-market economist Milton Friedman. One of the reasons she cited for raising her children in the US, aside from her marriage to the Harvard-educated Frank Rinehart, was the hope that they might be taught by Friedman. She is also a climate change sceptic, and close to the British Viscount, Christopher Monckton. On a visit to Perth last July, during which he delivered the Lang Hancock Memorial Lecture, Monckton spoke of Australia's need for an equivalent of Fox News, which could be funded by the "super-rich". Rinehart was not present at the private meeting, but few doubted the identity of the "super-rich" person whom Monckton had in mind. When a video of his remarks was posted online, it heightened speculation that she was pursuing some kind of Foxification strategy in Australia. I have also been told by one of her associates that she met Rupert Murdoch earlier this year, partly to discuss Fox News. Given that the newspapers published by Rupert Murdoch's Australian arm, News Ltd, boast a 70% share of Australian readership, and that Fairfax has the remaining 30%, the widespread fear is of a conservative duopoly, and an end to editorial pluralism. Rinehart's $A165m (£107m) stake in Channel Ten has already lost more than half its value and Fairfax, which last week announced 1900 job cuts, is not seen as a particularly attractive investment. Like her father, who started two newspapers, the profit motive is not a major consideration. Her investment, it is thought, is about political influence. Besides, the amount of money involved is for her comparatively small. As an associate recently explained to me, she is adopting the same approach that the super-rich use when purchasing luxury yachts or private planes, which is not to invest more than 10% of their wealth. In her ongoing drive for influence, the debate two years ago over the Labor government's plans to hit the mining sector with a super profits tax was a major milestone. Unusually for a woman who has preferred to exert a behind-the-scenes influence, Rinehart led the chant of "axe the tax" at a protest rally in 2010 aimed at the then Prime Minister Kevin Rudd. Her billionaire activism lent itself to easy caricature. A reporter from the Fairfax-owned WA Today joked that it was possible to hear her gold bracelet jangling "a note-perfect version of 'Money, Money, Money' as she pumped her fist". Within weeks, however, Rudd had been ousted, and his successor, Julia Gillard, immediately announced a climbdown over the mining tax. Just as Rinehart wants influence and gratitude, she is also determined to maintain rigid control of her company. Presently, she is locked in a highly-publicised legal battle with three of her four children over a family trust set up by Lang Hancock for his grandchildren. The trust, which owns a share of her company, was due to settle its assets last September, when Lang's youngest grandchild, Ginia, turned 25. But Rinehart allegedly tried to push back the date that her children could become trustees until 2068. Determined to retain sole control, she warned her children they faced ruin if they refused to bend to her will. "Sign up or be bankrupt tomorrow," she threatened in an email. "The clock is ticking. There is one hour to bankruptcy and financial ruin." Her three eldest children described the manoeuvre as "deceptive, manipulative, hopelessly conflicted and disgraceful". It is not so much about greed. Rinehart offered her three estranged children big payments to go along with her plan. It is more about control. Commentators expect the same aggressive approach with her media strategy. After all, Australia's richest ever person is used to getting her own way.